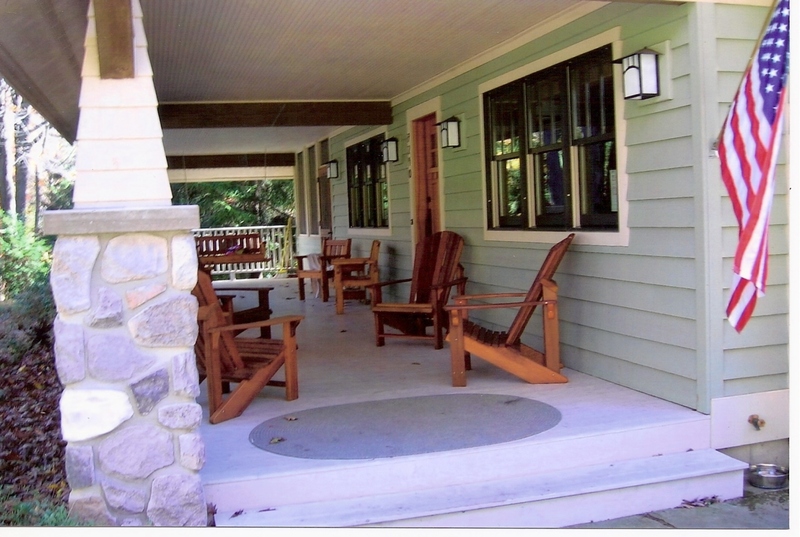 It’s been twelve years since my wife and I completed the building of our cottage in the woods, and it wasn’t long after finishing that I began writing. In looking at some of the pictures of the process, I can see our wide-eyed innocence in the early shots, and the knowing weariness of experience in the pictures toward the end of the process. I still love my house. And, although the trilogy won’t really be ‘done’ until it’s published, I still love my story and characters, too. There are lessons from house-building that helped, and will continue to help, with my writing. Know where your heart longs to dwell: Building your own house is a long-term commitment. You’re going to spend a lot of time there, so it ought to be a place you love. The same goes for writing. You’re going to spend long hours in the setting and with the characters. It helps if they are dear to you. For me, in both cases, I knew my heart would be most at peace in a historical setting. I’ve always loved the craftsmanship, human scale, and form-follows-function aspects of Arts and Crafts architecture, and I’m fortunate that my wife feels the same. We spent years looking at style and plan books and magazines, and studying the aspects of existing houses we loved before drawing the plans for our house. In the case of my trilogy, my heart longed to dwell in an epic tale, set in an ancient world I can only experience though the written word. I spent years reading the genre before selecting the niche that would house my story. 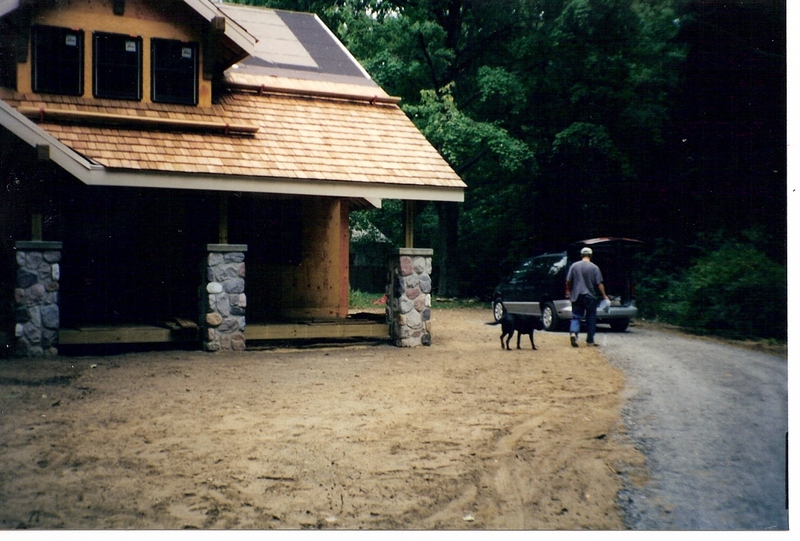 Start with a solid foundation and quality materials: In the case of the house, we didn’t cut corners, and went with a full masonry foundation, hearth and chimney. 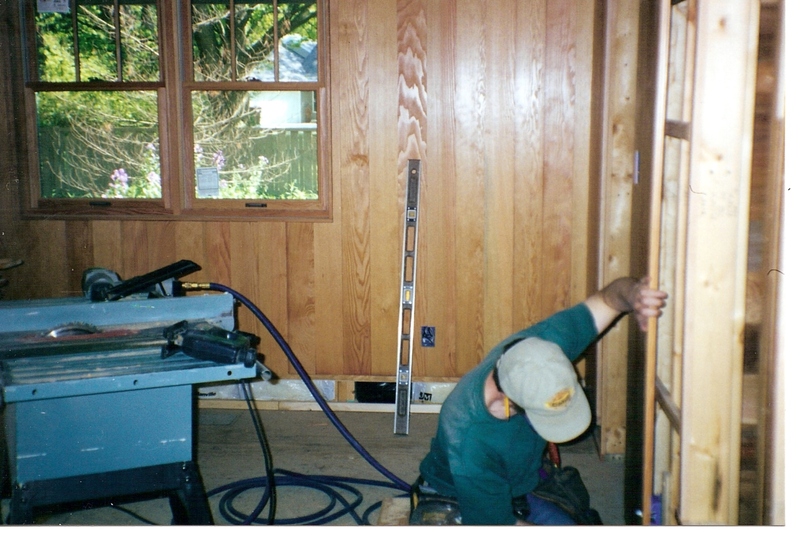 Since we were in the forest products business, top quality lumber went into solid framing techniques and authentic wood finishes and details. I know the house has a firm footing and good bones. The same goes for writing. I did several years worth of research, in my case on the Germanic tribes and the ancient Roman Empire. I had most of my character and place names picked out, and those names have meaning for me. I wrote out a backstory and an outline. Don’t get me wrong, there were surprises along the way, both in building the house and in writing the trilogy. I consider myself a pantser in writing, and now that I think about it, I’m also a bit of a pantser when it comes to carpentry. And many of those serendipitous surprises made both projects better. But you want to have a solid structure in place before you start the process of fleshing it out. I t’s the details that add the richness: There are certain elements I love about the A&C style that evoke the feelings I sought in our house. The glowing warmth of lacquered Douglas fir paneling, the impression of solidity offered by exposed beams and brackets, the reminiscence of subway tiling and bead-board, among many others. But you can go too far as well. We had to pick and chose the elements that complimented one another to create a unique whole. The same rules applied to story elements and research details for my writing. It took me a long time to understand that not every historically accurate detail can be added. A few well-chosen tidbits enhance the flavor. Likewise, too many subplots can detract from the primary thrust of the story. But I still prefer solid wood paneled wainscoting with matching crown, base, and casing to an unadorned drywalled square of a room. All the elements of the architecture, along with a few well-chosen authentic period accessories, all go a long way to evoking feeling for those who visit, making them want to return again and again. Take it day by day: Undertaking such a large project can be daunting at first. I particularly remember the feeling after the first day of hand-hammering our cedar shingles. My wife and I started the roof with neither of us having ever nailed a single wood shingle. It was July, and we guessed that with the long weekend for Independence Day thrown in, we might be able to complete it in a month of weekends. 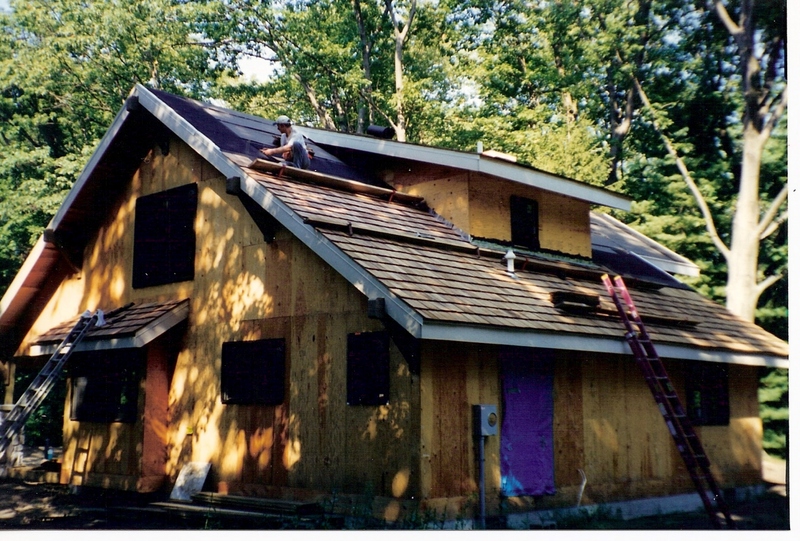 We laughed about that as we nailed the ridge shingles on in a light swirling snow (yep—November!). After that first day, we only had about three courses on one side of one portion of the house. But we kept at it, every chance we got, dawn till dusk. And now, twelve years later, without a single leak, who cares how long it took? And each stage was more of the same—daunting but, through steady effort, finally done. Writing is the same. Day by day, word by word, sentence by sentence, you get to a draft. Then, step by step, you revise and polish. Some days it feels like it’ll never end. But afterward, when I see my books in print, I’ll look back and it won’t matter how long it took. Leap of Faith: Both the house and the trilogy were projects that required not only a willingness to work hard, but a leap of faith just t o begin. I had to just dive into both. Both projects make me wonder whether I would’ve undertaken them if I’d known what I was in for along the way. It’s been nine years since the inception of the trilogy, and the revisions continue. Building the house is one lesson among many. Slow and steady has served me well in life. I know I’ve built my trilogy with good bones and a solid foundation. I think I can make it into the kind of world and story certain readers will want to visit again and again. What about you? Do you ever feel daunted by the process? Have you done something that required a leap of faith? Are you better for having done it? This entry was posted in Writing and tagged arts & crafts, carpentry, patience, Writing. A wonderful analogy, Vaughn, and I loved seeing the pictures of your house. You must feel such pride in knowing the two of you built it yourselves. I think writing is a continual leap of faith, whether you’ve been published before or not. Every story, every time, is different, and all you can do is close your eyes and jump, and hope the story is strong enough to hold you up. It does feel good, Liz. There were many mistakes during the process, but nothing that couldn’t be fixed, patched, or accepted. So I’ve got the leap of faith thing to look forward to again and again? I’m not sure I’ll ever get used to it, but I least I know it’s coming and that it probably won’t kill me. 🙂 Thanks for the warning, and for reading and commenting! This is one of the best posts I’ve read about the writing process. It could only come from someone who’s journey has taken them to this point of awareness. As writers, I truly believe that our journey is what the reader comes to the page for…and if we’ve chronicled it well, that journey will stay with them (and with us as writers), long after we have all reached the destination. Thanks for the high praise, Bernadette! I was standing on the porch a few nights ago, waiting for the dog and thinking about the revision process, when it struck me. I just have to be patient and stay with it. Hopefully I’m building something that will last–as you said, a journey that will stay with the reader as well. Your home looks beautiful. I can’t imagine your writing being any less solid. Re leaping: oh, yes. Marrying the ToolMaster when I was in med school after everyone had told us about divorce statistics for physicians and our age group; having children when I was born with congenital heart disease; leaving medicine so I could spend more time with said children… Wish I could say I was an accomplished jumper at this point, but every big thing still feels like parachuting above a cactus patch. Yes, the FROG is actually sunning itself in the bottom shot. 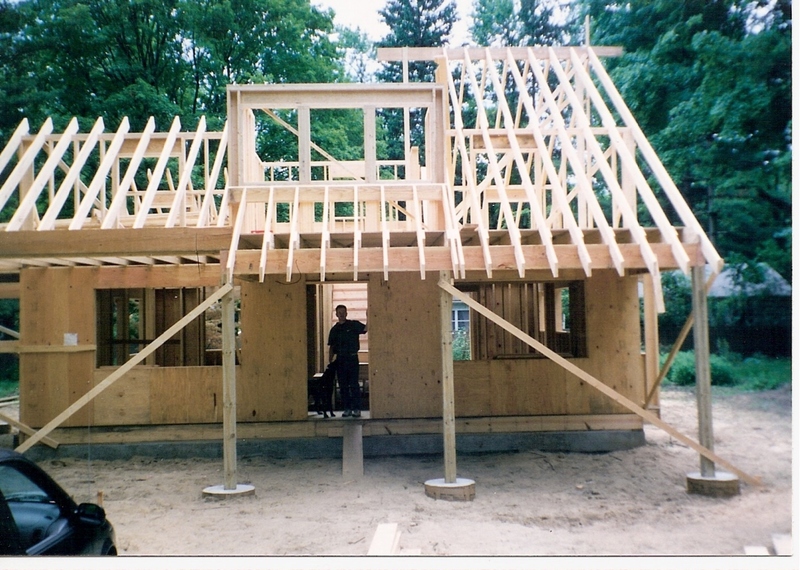 🙂 I built that about five years after we finished the house and, as with each additional manuscript, I can see the progression of my skills in the execution. 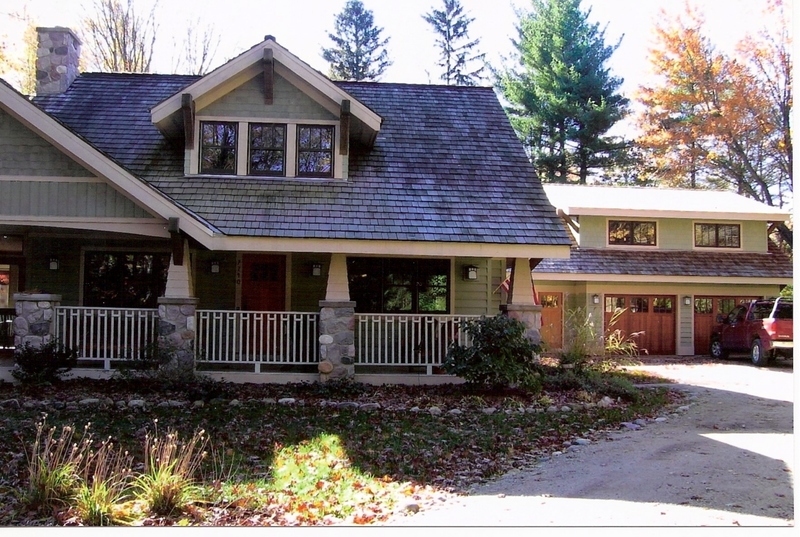 Roycroft is an Old English name for a royal craftsman. In both carpentry and writing, I strive to be worthy of my moniker. Thanks, D! I know I have been connected to you for a while, Vaughn, but this post jumped up and grabbed me by the collar. I’ve read it four times. I am amazed (and feeling a little stupid) that I haven’t followed your blog. I am amending that right now! This post is amazing. Your analogy, the foundation, the bones…wow and woah. My writing life has been a huge struggle. I have worked tirelessly, sometimes to a fault I think, on perfecting the craft. I worry and stress over a single sentence for weeks on end. I don’t put anything “out there” until it is so perfect…and then once it’s posted I find something I could have done better, or differently. Awesome post. Tweeted. Will share to FB. I’m so honored by your words. It means so much, because I’ve respected your blog for so long, and I’m so new at it. It’s funny, but for the last few weeks I’ve been hanging my head over how long it’s taking. Coming up with the analogy really put it in perspective for me. I want the impression my work makes to last as long or longer than this house. Knowing you’re an editor, I think I can understand how hard you are on yourself. But I also think you’re wise to be judicious about when to put your work out there. Your blog posts have long shown your devotion to quality and craft. Thank you so much for your lovely comment, Karen. And thanks for sharing! “I’m so new at it.” Ha! You are a blogging inspiration. I’ve been working on collections for over seven years. But you know they are going to be darn good (and clean!) when they are birthed! Enjoyed this Vaughn. Great analogy and a beautiful house. You make it sound heavenly. I “lived” in a house under renovation once and well, I’ll just re-read your post instead of thinking about that project. I actually think renovation is even more difficult, Stacy. At least we weren’t forced to live in the house the entire time. But we did have a port-a-john… in winter… Just sayin’… 😉 Thanks so much for reading, commenting, and for your kind praise. Second, you are right on with all of these things. I always say I’d rather write one amazing story that never gets published than a million ones that do but aren’t true to my heart. That’s what I felt in this post–getting to the heart of things, no matter how long it might take. Thank you so much for sharing a little bit of your journey and your life with us. This is a beautiful analogy. How much love, time, and creative brain power we devote to our projects! And to answer your questions, yes! I’ve taken a leap of faith many times, including marrying the love of my life against odds and giving up a job I adore for children and writing! Ultimately, the act of taking the leap is sometimes more important than the end goal. Lovely post, Vaughn! You bring up something that I didn’t really touch on, regarding leaps of faith. There’s almost always a sacrifice. So often we not only have to put ourselves out there and take a risk, we have to give up something. But I think that makes the journey all the more special. Good on you for taking those leaps, in spite of the sacrifice. We’ll get there! Thanks for reading and for adding to the conversation, Heather! What a beautiful home, and a perfect parallel of experiences. My husband is more of a visionary than I am, and he amazes me everyday by showing me how to stop chasing dreams and start catching them. That’s what your decisions demonstrate as well; the ability to dream big and also see them through to an amazing reality. You’re an inspiration. Thanks, Nicole! I’m honored. Sounds like we’re both lucky to have our spouses–mine’s a dream-catcher, too. 🙂 Very glad you were inspired. Thanks for reading and commenting! Great analogy Mr Roycroft. Great to see the photos of your building progress too! And BTW, I LOVE your house! I am one of those people that, when I get my issue of “This Old House” magazine, I devour it. I love looking at that type of stuff, though to be honest, I don’t know that I would ever be one to renovate or completely build my own place. But I sure do like to watch the transformation! I’m such a big old fan of This Old House. Which reminds me, I still need to dig up pics of our attic from IL for you to see the WW2 posters. Cool that your dad was a carpenter. My grandfather was, and I still have many of his hand tools. So glad the analogy works for you. Thanks for reading and commenting! I know your house dreams are about to come true. I’m here for you, whenever you need me. In fact, if you and Dave need a carpenter to fly over and help you out with any remodel projects, I’m totally there. I wonder if they’ll make me check my tool belt. 😉 Thanks, Heather! Long time listener, first time reader. I love this, this whole thing. The house, the passion, the team work, the writing. As I read, I was tearing up. For nostalgia for sure, for missing Michigan but there was something else. A guide to opening my own business. How many times I’ve said “Uh, forget it, just buy the cheap stuff, that’ll work for now”, and yet, I’ve slowed down and can start with “a solid foundation and quality materials”. Something that has also slowed me down and offered great pleasure, “the details that add the richness”. If I’m rushing, I miss the sweetness. All in all, a leap of faith… a great bit of humbling and the clarity to move past the rational mind. Thank you for all the memories you gave to us in this home and all the adventure you will give us through your writing. The memories here are my pleasure. Speaking of which, in looking through the pics, I had to laugh at the shot of you hammering your one nail in the house. Glad we documented that. Of course you know you contributed in so many (actually valuable) ways, too. 😉 Happy birthday, and thanks for reading and for making me all teary, Sis! This is absolutely beautiful – the comparisons, the writing — and the HOUSE! omg, I love your house – and to think of the work you put into it with your own hands, what a feeling that must be. I look forward to reading your trilogy, dear Vaughn. I’ll be so honored to have you read once they’re finally available. You’re awesome, my friend. Thanks so much all your great support! Vaughn, I loved this. There are lots of artists in my family, so I’d often felt the connection between painting and writing, or filmmaking and writing — but I really enjoyed following along with you respecting the importance of the structural bones of stories and house building. I’m a Michigander as well, and remember the years my grandparents hand-built their home in Traverse City — selecting and hand sanding all the moldings, invested in the quality of the outcome, knowing they would live with it for the next 30 years — so could imagine your process. The house is beautiful. As for the trilogy, I’m with you that, no matter how urgently we want to see a published book on a shelf, the time invested in quality is worth it. Good luck with it, and I look forward to reading your posts. My extended family was a big part of the house-building process, so after being a part of your grandparents’ journey, I can imagine just how well you draw the associations. BTW, ours is a resort area for Chicagoans, so our retreat from their retreat takes place in the Grand Traverse Bay area. Love it up there. Well I definitely enjoyed reading it. This information offered by you is very practical for proper planning. This is such a fabulous blog post. Congratulations on building your own house! That’s incredible. My dad is a self-taught carpenter, and he just finished building a side-house for our ever expanding family. I’m amazed when I see pictures (I still haven’t seen it in person, yet). My grandfather was also a carpenter, and even hearing the word “cedar” brings back incredible memories. You touched on so many important things in this post, and I love how you tied it in with building your house. It’s very easy to get overwhelmed by the process. The biggest thing I’ve done that took a leap of faith was moving from Alabama (where I lived for 23 years) to Colorado. We’ve been here five years now, but it was very much touch and go from the second we got here. Overall it’s been a good experience, but it was the hardest thing I’ve ever done. Leaving your family, friends, and everything you know to move away to a place you’ve never even visited is a little nuts–especially since we didn’t have jobs. But I grew. I discovered just how strong of a person I am. I got a good job, got married, dove into my writing and editing, finished my master’s degree, and I’ve written three novels. I don’t know if I would have done all of those things if I wouldn’t have moved. The word cedar does it for me, too. Actually, the smell of freshly sawn cedar is one of the most evocative in the world to me. Seeing your dad’s work in person is sure to be a moving experience. Give him a pat on the back for me, one (mostly) self-taught carpenter to another. Wow, you really have taken a leap of faith, Courtney! It’s funny how taking them makes us grow like that. And grow you have! Congratulations on the accomplishments born of your leap. Thanks for the follow, for reading, and for the awesome comment, Courtney. And thanks for being a part of my supportive tribe (loves me some Hugs and Chocolate! 🙂 ).